Sushi has become its own food group in our daily diet. The world is crazy about sushi and we have so many options, from sashimi to maki rolls. Could you be eating sushi too often? Is a daily or even weekly habit of eating sushi healthy? 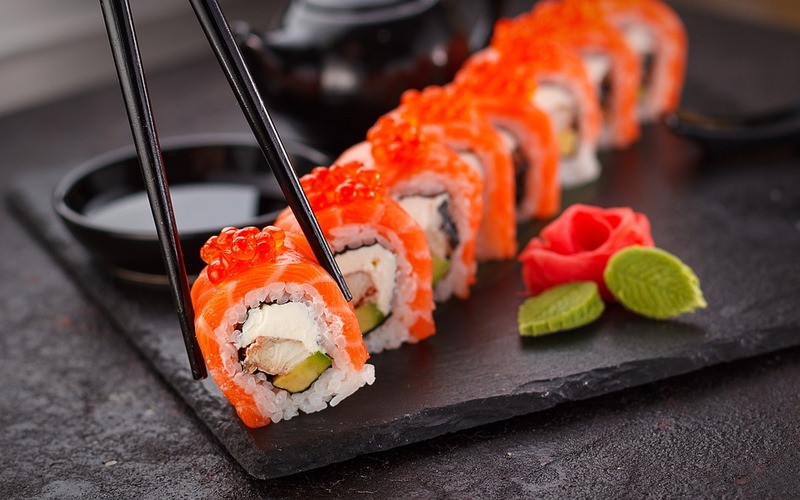 The first thing we should know is that sushi is packed with omega-3 fatty acids which have been linked to a list of health benefits from preventing heart disease, fighting type 2 diabetes and supporting brain health. Eating raw fish could be the best way to get these benefits from omega-3 fatty acids. If you fry a fish or you put cook it in a microwave, you may reduce the levels of these healthy fats. However, there are some groups of people which should not eat raw fish. Babies, young children, older adults and people with a compromised immune system should avoid eating raw fish. Also, pregnant women should avoid sushi due to a risk of potentially getting parasites and bacteria that can be harmful to the child. Also, the high level of mercury which can be toxic in high levels and dangerous for babies is one of the main reasons why we don’t recommend for a pregnant woman to eat sushi. Mercury is the main reason why we ask this question: how much is too much when it comes to sushi? The American Heart Association recommends having two average meals per week for low-mercury seafood and less if you are eating raw fish with higher mercury levels. The important thing is a varied diet with a combination of vegetables, healthy fats, fresh fruits, whole grains, lean proteins and healthy carbs. If you didn’t know, a tomato is a fruit. How come? A tomato has seeds and it develops from a flowering plant while vegetables consist of the plant parts such as stems, roots, and leaves. Yet when it comes to nutrition, tomatoes are categorized as vegetables such as seedy vegetables like zucchini and cucumbers. One medium tomato has 22 calories and it is packed with nutrients which are linked to many health benefits. Tomatoes are rich in vitamins and they can protect heart health. Tomatoes contain an antioxidant, lycopene which is responsible for the red color of tomatoes. Researchers have confirmed that it’s healthier to eat tomatoes than to take lycopene supplements. Lycopene is also good for your vision and eating tomatoes can have a great impact on your vision. Plus, a combination of tomato paste and olive oil can give protection to your skin from sun damage. Lycopene is the key of almost all health benefits of tomatoes. It has the highest concentration when tomatoes are cooked, that’s why you should add cooked tomatoes or tomato paste to your dinner as much as possible. Furthermore, tomatoes can boost digestive health, protect you from cancer and it can help those dealing with diabetes. In a society where everything is social, we social human beings are becoming more isolated than ever. People are busier than ever, they are more distracted than ever which leads to the feeling that we actually don’t need to go out and socialize. Everything is just a few clicks away and chatting with friends seems too easy. However, we do need to get out and socialize, because if we don’t we pay the consequences of loneliness. Loneliness can be as damaging to our health as much as smoking. The effects of not talking and interacting with others can have a direct impact on our physical and mental health. How to socialize more often? Many complain that they can’t find like-minded people. Well, go to the places where like-minded people hang out. If you like mountain climbing, join a club and meet other like-minded people. If you are passionate about yoga, go for a drink with people from yoga class. Or if you like jazz music go outside to a jazz club and meet new like-minded people. Becoming part of certain activities and clubs is the easiest way to meet new people. What’s great about it is that those people probably share your interests. Go outside, smile and don’t be lonely.